Here’s How the ANC 1A Races Are Shaping Up | Park View, D.C.
I’m sure most folks aren’t really focused on the November 4th elections — and then if they are, they are probably more aware of the races for Mayor or Council. That said, there are other races that voters should be aware of an which I’ll write more about as we get closer to November. For now, I wanted to let residents living in the area represented by Advisory Neighborhood Commission 1A know what to expect in the next election. The deadline for turning in nominating petitions has past, and the period in which to challenge those nominating petitions ended at the close of business yesterday, August 18, 2014. Presuming that all the candidates who turned in their petitions survived the challenge period (and I have no reason to believe anyone didn’t), the people running to represent their Single Member District’s (SMD) this fall will be the following. You can refer to the map above for an idea of where the SMDs are located, and I have listed the incumbents. No candidates stepped up. But, anyone interested in this seat can still run as a write-in candidate. 1A06 Patrick W. Flynn (Incumbent) — Facebook page here. 1A08 Kent Boese (Incumbent) — Campaign Web site here. 1A10 Rashida Brown — Campaign Web site here. Among the aspects of this election cycle I find interesting are that the 2015-2016 Commission will be composed of 8- 9 new Commissioners which is a high percentage of turn over. 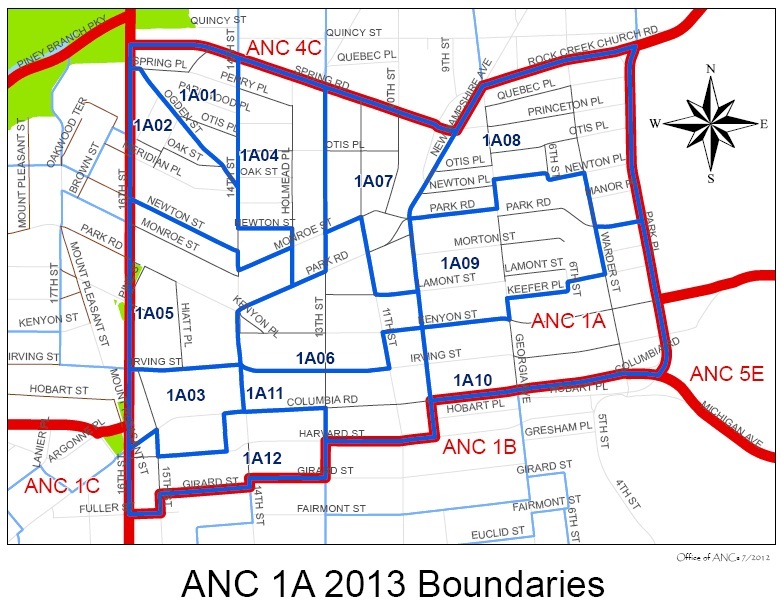 I understand the ANC 1B races are similarly situated. I also find it interesting that the Single Member Districts where no one has shown interest so far are west of 14th Street and include the large apartment building over the Metro and DC USA. It is also good to see that several of the races are competitive this year, which should give voters an opportunity to choose from among the candidates. I’ll post more about these candidates as we get close to November. This entry was posted on August 19, 2014 at 7:01 am and is filed under Elections, Government. You can subscribe via RSS 2.0 feed to this post's comments.